Vitamin B12 (Cobalamin) is one of 8 B-vitamins. B12 is water-soluble and found in every single cell in your body. Vitamin B12 is essential for the synthesis of DNA, RNA and neurotransmitters, the maintenance of myelin sheaths protecting neurons, and red blood cell formation. Deficiency in B12 results in myelopathy (spinal cord disease), neuropathy (nerve disease), sensory disturbances, imbalance when walking, weakness, and psychiatric problems ranging from cognitive and behavioral problems to dementia. Cerebral Circulation: Vitamin B12 is needed to regulate homocysteine. High homocysteine levels are linked to inflammation that can lead to blood vessel damage. And possible plaque buildup leading to heart attack or stroke. Neurotransmitters: Vitamin B12 is a cofactor in the synthesis of neurotransmitters dopamine, GABA, norepinephrine, and serotonin. Affecting alertness, cognition, memory and mood. Mood: Vitamin B12 helps increase brain serotonin and dopamine levels. Decreasing anxiety, depression, fatigue and pain. How does Vitamin B12 (Cobalamin) work in the Brain? 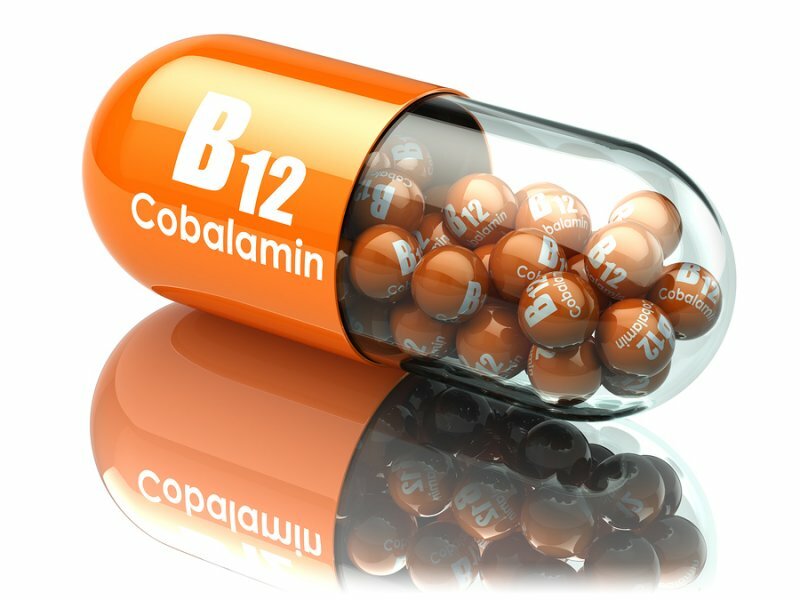 How does Vitamin B12 (Cobalamin) feel? Vitamin B12 (Cobalamin) is one of 8 water-soluble B-vitamins that are absolutely vital to the highly optimized brain. And is essential to every cell in your body including your brain. Vitamin B12 as a nootropic can improve alertness, energy levels, boost attention span, concentration, intelligence and memory. B12 supplementation can help relieve stress, depression, insomnia and help balance your mood. Vitamin B12 is absorbed in your intestines from food or a supplement using a process called intrinsic factor. The vitamin is then transferred to transcobalamin II (TC-II/B12) which acts as a transporter. Foods rich in Vitamin B12 include fish, shellfish, meat (especially liver), poultry, eggs, milk and milk products. [iii] The two best sources by far of B12 are clams and liver. And Vitamin B12 is light sensitive. If stored in open bins or clear plastic bags or jars, B12 vaporizes and disappears. You are much safer using a good Vitamin B12 supplement for your nootropic stack. See “Available Forms” for more. Vitamin B12 (Cobalamin) boosts brain health and function in several ways. But two in particular stand out. 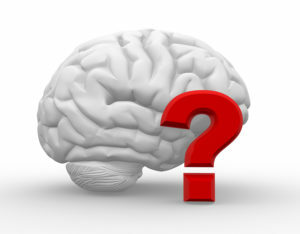 Vitamin B12 increases cognition. Vitamin B12 is a precursor in the biosynthesis of all major neurotransmitters in your brain including acetylcholine, dopamine, GABA, norepinephrine and serotonin. Vitamin B12 is an integral part of the one-carbon cycle involved in the synthesis of methionine. This amino acid, methionine donates the methyl group required for methylation to occur. This biochemical process helps synthesize neurotransmitters, myelin (the sheath that protects neurons), and keeps homocysteine levels in check. Elevated levels of homocysteine have been associated with several neurodegenerative diseases including Alzheimer’s and Parkinson’s Disease. Even mild Vitamin B12 deficiency has been associated with accelerated cognitive decline. Researchers at Tufts University examined data from 549 men and women enrolled in the Framingham Heart Study. They focused on scores on the Mini-Mental State Examination (MMSE), which is a short list of questions and tasks used to screen for dementia. The subjects were divided into 5 groups, based on their vitamin B12 blood levels. MMSE scores declined by 0.24 points per year over the 8-year follow-up period. Cognitive decline was faster in the bottom 2 groups that had the lowest levels of Vitamin B12. Vitamin B12 helps reduce depression. Vitamin B12 is a precursor in the biosynthesis of GABA and serotonin. GABA is an amino acid and neurotransmitter produced by glutamate in your brain. This inhibitory neurotransmitter prevents other ‘excitatory’ neurotransmitters from being released. Resulting in an anti-anxiety and calming effect. Serotonin is a neurotransmitter made from the amino acid tryptophan. This inhibitory neurotransmitter governs the stimulatory neurotransmitter dopamine from overwhelming your brain. Adequate serotonin levels make you feel confident, easy-going, flexible, happy and positive. One case study out of India reviewed the case of a 57-year-old woman who was given months of anti-psychotic and antidepressant medications. Including 2 rounds of electro-shock therapy before anyone thought to check her Vitamin B12 levels. This woman’s symptoms included anxiety, constipation, movement abnormalities, perceptual disturbances (hearing her name called), lethargy, tearfulness and finally catatonia. She remained depressed, suicidal and lethargic despite her treatment. Vitamin B12 deficiency usually causes neurological and psychiatric issues in adults aged 40 – 90. B12 deficiency rarely affects younger people. But can be a problem if the mother is deficient during pregnancy. A B12 deficiency can manifest as disease of the spinal cord (myelopathy), disease of the nerves (neuropathy), sensory disturbances, gait abnormalities, weakness, cognitive and behavioral disturbances and dementia. Vitamin B12 deficiency can often be caused by Pernicious anemia which is an autoimmune disease that affects the mucous membrane layer of the stomach. This can be a result of destruction of parietal cells, lack of hydrochloric acid, or a failure to produce intrinsic factor. Parietal cells are required to create intrinsic factor to supply your body with adequate Vitamin B12. When these cells are damaged, intrinsic factor is not produced. And B12 cannot be absorbed for use by your body and brain. Parietal cell death can be caused by excess alcohol consumption, ulcerative gastritis, H. pylori infection, gastric bypass surgery and even age. Intrinsic factor is required for Vitamin B12 absorption from food or supplements. If left untreated you experience B12 deficiency even if you’re getting B12 from food or supplements. If you or your doctor suspect Vitamin B12 deficiency and does a blood test, the labs may show B12 levels within the bell curve. But it doesn’t reflect how much B12 is actually in your cells. Pernicious anemia is sometimes passed down through families. This is most common in those of Scandinavian or northern European descent. Grave’s Disease, and Addison’s Disease. Type-1 diabetes can also cause pernicious anemia. Review the symptoms of deficiency listed here. Do your research. And if you suspect you may be deficient in Vitamin B12, tell your doctor and take action now. If your doctor tells you it’s not a problem, please find another doctor! Vitamin B12 is a co-factor in the one-carbon cycle that is required for the synthesis of DNA, RNA, neurotransmitters (acetylcholine, dopamine, GABA, norepinephrine and serotonin), and the myelin sheath that protects each of the neurons in your brain. This one-carbon pathway is involved in the synthesis of the amino acid methionine. This amino acid donates methyl groups for the methylation of DNA, RNA, neurotransmitters and myelin. Methionine is synthesized from the amino acid homocysteine. Preventing high levels of this amino acid to accumulate will prevent problems throughout your body including neurodegenerative disease. 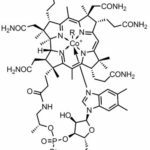 Cobalamin is also required for the conversion of methylmelonyl CoA into succinyl Coenzyme-A for the myelin sheath that protects your neurons. Problems with this conversion degrades myelin. Causing problems with your central nervous system and damaging axons on the neurons in your brain. The key message here is to maintain optimal Vitamin B12 levels in your body and brain. Don’t be duped by marketers selling Vitamin B12 energy drinks boasting more energy. Or a magic pill to boost memory, or aid in weight loss. If you have a specific health problem like pernicious anemia or are deficient in this vitamin, then B12 can help. If you maintain optimal levels of Vitamin B12 in your system, supplementing will not increase your energy levels. Vitamin B12 is a key brain vitamin that plays an important role in a healthy nervous system and optimally functioning brain. Low levels of B12 can definitely lead to poor memory and cognition. Neurohackers who supplement with Vitamin B12 report a reduction in brain fog and better sleep. People on statins for cholesterol and metformin for diabetes report a dramatic decrease in pain. Neurohackers report better focus and mood, colors seem brighter and more intense, energy levels improve, and an overall improved sense of well-being. If you are Vitamin B12 deficient you may feel a big boost in energy. And feelings of deep exhaustion can disappear within a few days. Much of the research in Vitamin B12 and B12 deficiency are presented as individual ‘case reports’ on one person. One report in French was about a woman with no history of psychiatric problems. But upon admission she was uncooperative, disoriented, had memory and attention problems, a sleep disorder and she looked older than her real age. This woman was depressed, had a guilt complex, devalued herself, and her movements and speech were very slow. A lab test revealed she had a problem with intrinsic factor. A study in Stockholm explored the association of low Vitamin B12 and folate levels with the occurrence of Alzheimer’s Disease. A population based study sampled 370 non-demented people aged 75 years or older and who had not been treated with B12 and folate. This group was followed for 3 years to detect the incidence of Alzheimer’s. The researchers compared low levels of B12 and folate with people who had normal levels of the two vitamins. Subjects who had low levels of Vitamin B12 or folate had twice the risk of developing Alzheimer’s. And this association was even stronger in subjects with good baseline cognition. Research shows that people with major depression often have low blood levels of folate and Vitamin B12. Low folate levels are also linked to poor response to antidepressants. And treatment with folic acid and/or Vitamin B12 has been shown to improve response to antidepressants. Folate and Vitamin B12 are involved in one-carbon metabolism in which SAM-e is formed. SAM-e donates methyl groups that are crucial for neurological function. Increased homocysteine is a functional marker of both folate and Vitamin B12 deficiency. Increased homocysteine levels are found in depressed patients. One study out of Norway showed increased blood levels of homocysteine were associated with increased risk of depression (but not anxiety). Vitamin B12 is water-soluble, and considered non-toxic in recommended doses. 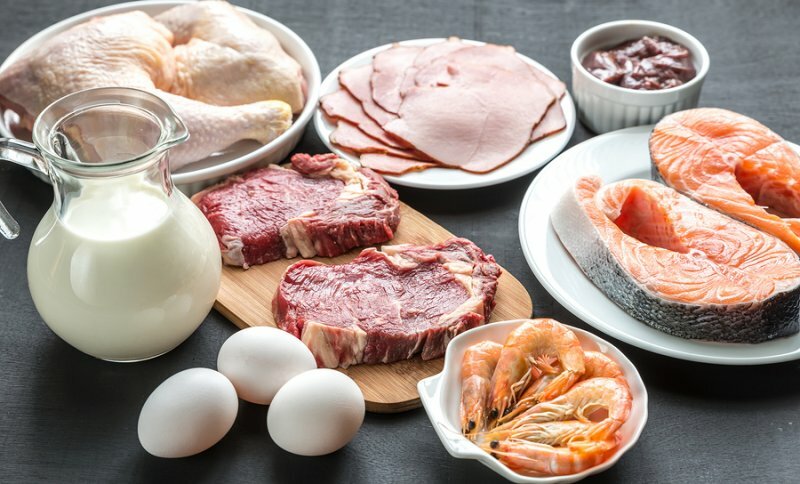 A varied diet including meat, seafood and milk products should provide enough Vitamin B12 to prevent deficiency. But vegetarians and vegans cannot get enough B12 from food and should supplement. Typical recommended dosage for nootropic benefit and optimal brain health is 100 mcg or 0.1 mg of Vitamin B12 per day. Neurohackers older than 40 and those who have a problem with Vitamin B12 absorption should use 100 – 400 mcg or 0.1-0.4 mg of B12 per day. Vitamin B12 (Cobalamin) is non-toxic. So is considered well-tolerated and safe. Doses as high as 2 mg of Vitamin B12 daily by mouth or 1 mg monthly by injection have been shown to produce no significant side effects. When high doses of Vitamin B12 are given orally, only a small percentage can be absorbed which likely explains the low toxicity levels. Proton pump inhibitors and other drugs used to treat acid reflux is known to prevent absorption of Vitamin B12. So you may need to take B12 sublingually. Antibiotics, drugs to treat gout and metformin to treat diabetes all decrease Vitamin B12 levels or B12 absorption. If you use any of these drugs you should have your levels checked and possibly supplement with Vitamin B12. Nitrous oxide used as an anesthetic and recreational drug oxidizes and inactivates Vitamin B12. So you should likely get tested and possibly supplement with B12. Vitamin B12 is available as tablets, capsules, liquid drops, sublingual tablets, sprays and lozenges. The sublingual tablets, sprays and lozenges are marketed as more absorbable or bioavailable. Some clinical studies do not support this claim but user experience shows otherwise. Logic tells us that a lozenge or spray absorbed under your tongue gets into your bloodstream and across the blood-brain barrier more readily than something you swallow and need to digest. Low quality Vitamin B12 supplements, and B12 found in multivitamins or B-Complex formulas, is usually cyanocobalamin. 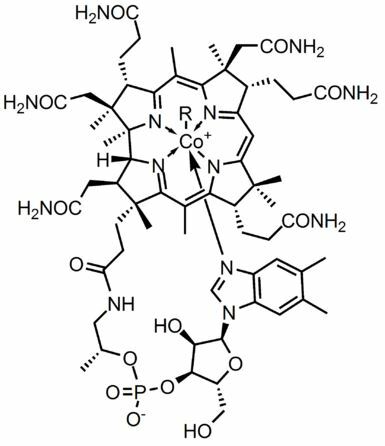 This form of B12 is not well absorbed, and produces a small amount of cyanide in your body (cyanocobalamin). Methylcobalamin is your better choice if you are deficient in B12, or have the MTHFR genetic defect which reduces your ability to methylate this vitamin. One good option is using a multivitamin like the Performance Lab® Whole-Food Multi which uses this nature-identical form of B12. Adenosylcobalamin works better for some who want to avoid the cyanide that comes in cyanocobalamin, and who can’t tolerate methylcobalamin. Hydroxycobalamin is another high quality form of Vitamin B12 that converts to methylcobalamin in your body. If you test Vitamin B12 deficient, your doctor may encourage you to get Vitamin B12 shots. Especially if you have pernicious anemia, nerve damage or chronic digestive problems like Crohn’s Disease or ulcerative colitis. But research has found that taking oral B12 supplements is as effective as B12 shots. [xiii] And user reviews support this finding. Note that Vitamin B12 needs to be balanced with Vitamin B6 and Folate (folic acid) for best results if using as a nootropic supplement. Again, a good option is using a daily multivitamin like the Performance Lab® Whole-Food Multi which contains nature-identical forms of both Vitamin B12 and folate. We recommend using Vitamin B12 as a nootropic supplement. Your body does not make Vitamin B12 on its own. So to get its benefits you must get it from food, or take it as a supplement. We recommend staying away from cheap cyanocobalamin B12 supplements. Go with Methylcobalamin, Adenosylcobalamin, or Hydroxycobalamin. Vitamin B12 is especially helpful for those dealing with brain fog, fatigue, nerve pain, sleep and memory problems. Vitamin B12 supplementation is critical for anyone over 40 years old because of absorption issues with B12 from food. Vitamin B12 is also particularly helpful if you are using proton pump inhibitors for acid reflux, have Type-1 diabetes, or show positive for dementia or Alzheimer’s. The recommended dosage for Vitamin B12 deficiency is 2,000 mcg daily for a week, then 1,000 mcg doses of B12 once per week for a month. Then your maintenance dose is 1,000 mcg monthly. Remember that Vitamin B12 needs to be balanced with Vitamin B6 and Folate (folic acid) for best results if using as a nootropic supplement. One excellent option for getting your daily dose of Vitamin B12 and folate is with my favorite multivitamin/mineral supplement – the Performance Lab® Whole-Food Multi. Thanks for your informative video about B12. B12 deficiency is a big issue, often misdiagnosed and patient recovery hampered by being not treated properly by the medical profession. I was diagnosed with B12 deficiency a year ago and was given ‘loading doses’ of 6 shots over two weeks and felt great for a month but then like so many others I’ve encountered since I crashed, could hardly stand up, very short term memory, couldn’t string a sentence together and was showing signs of Subacute Combined Degeneration of the Spinal Cord. Our NHS wouldn’t follow their own guidelines of alternate day injections until no further improvement so I ended up having to import my B12 from Germany and have been self-injecting daily since. I say this because whilst your video was informative, the last point you make about sublinguals / oral supplementation being as effective as injections is just plain wrong and could potentially be harmful for those with B12 deficiency. Oral supplements may alleviate some of the symptoms however they will not fix any underlying issues especially neurological ones, for that you need continual high doses like a waterfall in order for the body to have enough B12 to operate and to repair. It takes many years to get B12 deficient and may take many years to get better, I’ve heard of people who have been on daily injections for many years. I looked at the research you referenced for this quote – as well as being 12 years old it is also a very small study and seems to be mostly those over 60 years old and even says in the study that it’s not that good research. I feel perhaps your commercial interests have perhaps got in the way a little here and I urge you to point out to people that if they have neurological symptoms they should be seeing their doctor as not having proper treatment can lead to permanent damage. I discovered I have suffered my entire life with B12 issues, a lot is making sense now and it seems much of mine is simply down to genes which don’t methylate and recycle B12 properly. I’ve given up gluten again and many of my issues like anxiety have gone, however I still have to inject daily as the damage to my myelin sheath is almost certainly permanent sadly. Thank you for your work, I hope you understand my concerns. Steve, I appreciate your input and sharing your experience with us. I based my comment on injections vs. sublingual doses of Vitamin B12 primarily on user reviews and input from other neurohackers. I found when researching this post and as I mentioned in the video, there are no large clinical trials with large databases for Vitamin B12. Most of what I found were individual case studies. There is no ‘one size fits all’ in nootropics. You may be correct that injections are superior to oral or sublingual dosing for someone who is very deficient in Vitamin B12. And as a side note here, I do not have any ‘commercial interests’ in Vitamin B12 or the companies who make this supplement. My intention is to share what I’ve found so hopefully it’ll help someone, somewhere in the world get better. Fair enough, and respect for publishing my comment, hopefully will also help someone, somewhere in the world get better! I have a severe reaction to the tiniest levels of b12, in any of the 3 separate forms that i’ve tried (Cyanocobalamin, Methylcobalamin, or Adenosylcobalamin/Hydroxycobalamin). Tension headache, irritability, frustration, anger– all guaranteed. Even if i open a capsule and sprinkle a few mcg under my tongue, after about 20 mins, I can feel the signature tension headache building behind my eyes. Have you heard of anything like this before? My boyfriend has the same reaction, which is weird, because I haven’t found any similar reactions on the web, and we have totally different ethnic origins. We are both taking a form of Venlafaxine (SNRI), however, so perhaps that could be the cause of the reaction. I wanted to try it because I have persistent low energy, headaches, and depression, and I’ve had a very good reaction to Methylfolate, and would love to go off antidepressants eventually. Perhaps I don’t need b12 at all, though. Henrietta, that is a strange reaction and one that I’ve not encountered before. But if both your boyfriend and you experience the same reaction and are both taking Venlafaxine it seems we have the common denominator that could be the culprit. Take a look at the mechanism of action on how Venlafaxine works in your brain. And how B12 works in your brain. And it sounds like the drug is somehow interfering with B12’s normal mechanism of action in your brain. It’s unlikely the problem is during digestion and anything to do with intrinsic factor because you mention the same problem even when using B12 sublingually. See if anything in that post resonates with you and try some other nootropics. But please be careful about interactions with anything you try and Venlafaxine. See, in the first time I take b12 it was in liquid form and the amount por serving( 1 a day) was 2,500 mcg. With the actives Methylcobalamin and Adenosylcobalamin. But it was too much expensive, so once in solid form is more difficult to absorve but it was more cheap I decide to take 5000 mcg ( one per day ), to compensate the difficult that the body have to absorb the vitamin. Do I think it’s because of that ? Diogo, you have identified a very important point about bioavailability. Each of our body’s is different on how we digest and process everything including supplements. Liquids are generally more bioavailable than powders or other forms. It sound like your body is not utilizing B12 in capsule form as well as in liquid. But one thing … is the 5,000 mcg you are now using also methylcobalamin? Yes David, its 80% Methylcobalamin + 20% Adenosylcobalamin. I don’t know if I can mention here, but, the liquid form I was taken its was from Global Healing Center b12 vegan- safe. ( also with methyl (80%) and adenosyl(20%). The capsule form that im am taking now is from Seeking Health. Diogo, I’m not sure of the kind of reputation that Seeking Health currently enjoys. I’d check the reviews for that product and others produced by the company and see what others are saying. If I put the capsule form b12 sublingually, and generate salivary enzymes as the capsule dissolves in my mouth until disappears and pass to liquid form, I will be capable of increasing the absorption through my body, right? Diogo, taking a supplement sublingually does boost bioavailability. You could likely take the capsule apart and place the powder under your tongue. Not sure what that would taste like however. thank you for this fantastic article. Your website is a gold mine of curated knowledge! There seems to be a small typo in the section “Dosage Notes”, though. You wrote: “Typical recommended dosage for nootropic benefit and optimal brain health is 100 mcg or 1 mg of Vitamin B12 per day.” Shouldn’t it be “0.1 mg”? In the video on Vitamin B12, you unfortunately repeat the same mistake (if it really is a mistake) a couple of lines later. So I guess you already corrected this post, but missed one occurrence of the “1 mg”. Lasse, I really sucked at math in school as you can see. And I missed that one so thank you. You are correct about the dosage.